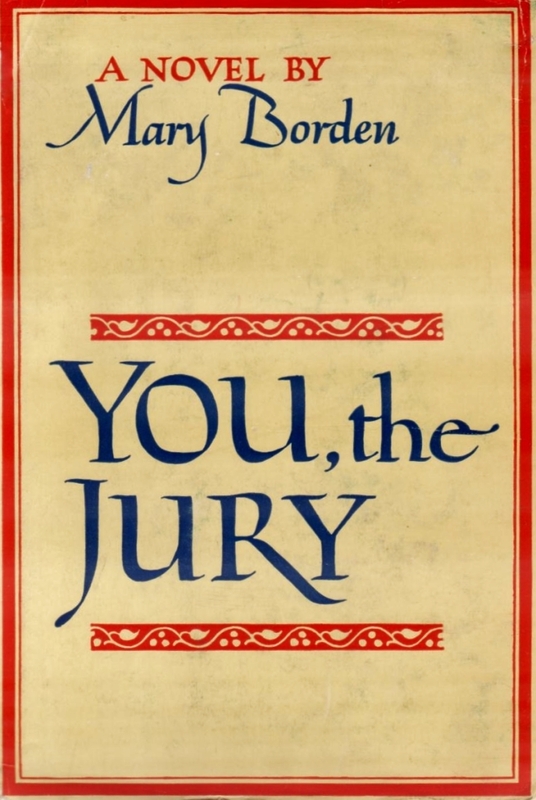 You, the Jury by Mary Borden, 1952. Alternate title: Martin Merriedew. This edition: Longmans, Green and Co., 1952. Hardcover. 346 pages. An unreliable narrator, a damning society, a haunting question. We grew up together. I didn’t get on with him too well once the first excitement wore off (it was wonderful making a friend of our very own), but my brother Francis adored him, they were like David and Jonathan, so I had to go on being friends if I wasn’t to be left out of everything. And I wanted him to think well of me, he was a glorious boy, but he wasn’t the sort of person you could be comfortably fond of, he was too independent and expected too much. Eventually you either gave in to him and loved him blindly, or came to hate him; it was the same with almost everyone who knew him. So speaks narrator Barbara Patche, looking back from 1951 to the childhood day in 1914 when she and her brother met seven-year-old Martin Merriedew, whose influence on them was to mark and change the expected pattern of their future lives. Barbara and Francis are the blue-blooded children of an English earl and reside in a typically stately country home; Martin is the child of the newly arrived village doctor whose calm good sense proves a godsend to the Patche family, aiding as it does to the successful treatment of Francis’ crippled legs. Martin takes his medical degree, Francis steps into his father’s place as the new lord of the manor, and both set the countryside all agog with their eventual establishment of a medical clinic funded by Francis’ inheritance, and run along the lines of medical common sense mixed with a dash of faith healing. For Martin is steadfast in his belief that he knows the will of God – at least as it applies to himself – and when the Second World War breaks over England, he steps forward boldly to proclaim his conscientious objection to taking life, and is posted as a medical orderly (he has since stopped practicing as a doctor for reasons I will leave up to the author to explain) to a front-line surgical station. He and Francis have become estranged some years previously; Francis has followed the way of his more mainstream peers and has joined the air force and is engaged in active combat. Something happens at the front; Martin is charged with treason and sent back to England to stand trial as the war winds its way into its final days. The penalty, if a conviction is attained, is automatically death. In a strange twist of fate, the judge who presides over Martin’s trial is Barbara’s husband. Barbara and Francis are shocked and silent spectators as Martin is tried for his life. As you might suppose, this is not a cheerful sort of story, but instead a deeply thought-provoking examination of what it means to be a true pacifist. Though it can’t avoid a certain amount of sensationalism, the atmosphere throughout is tense with foreboding, and the importance of what isn’t being discussed looms larger than the charges of the village gossips and the headline writers. I never felt that I got to really know any of the characters in a truly intimate way; too much is unsaid, and Barbara’s point of view is always just slightly open for interpretation. By the end of the story we know the most about her, and only what she allows us to know about the others in that forged-in-childhood triumvirate which has parted and which comes together so irrevocably those decades later. I won’t detail the ending, but I will say that it was more than slightly ambiguous. Neat solutions and tidy wrap-ups not to be found here. An interesting book, beautifully written in a tense, controlled, dispassionately stoic tone. It works, in this case, quite well. An author I will be reading more of, if I can. This was a random acquisition at a book sale a year or so ago, added to the stack after a quick glance inside and the reading of a few paragraphs hinted at something promising. It has taken me some time to get around to reading it, and the paradoxical reward for my procrastination has been the discovery of yet another author-of-note to add to my list of look-for names while out upon the old-book hunt. A modest amount of research reveals that Mary Borden was a woman of some accomplishment. Daughter of an American millionaire, against all expectations and with no medical training, she spent the Great War voluntarily and by all reports quite brilliantly and efficiently running a field evacuation hospital in one of the most active war zones in France. She wrote a damning (and suppressed – it was not published until some years after the war) memoir of the carnage she witnessed, the recently republished The Forbidden Zone, reviewed in detail here, at Open Letters Monthly. Taking up writing after the war, Mary Borden produced a number of well-regarded novels, most with serious or suspenseful themes. (You, the Jury, was her last published work. Mary Borden died in 1968, at the age of 82.) She served again in Great Britain during the Second World War, financing and operating an ambulance unit. As well as her novels she apparently wrote at least one further volume of memoirs. Why have I never come across this writer before? I am sure she must be – or was once – fairly well known; her books are in good supply in the used book trade, in multiple editions. Is anyone else familiar with this writer? And if you’ve read this or any other of her books, what did you think? I myself am quite impressed, though I hesitate to recommend this particular book without a caution that it’s not a very typically appealing sort of thing. Hard to classify, really. A product-of-its-time psychological drama? Edited to add that someone else certainly knows about Mary Borden – Roger who has kindly commented below points us in the direction of an online appreciation and a link to a recent biography of Mary Borden here, as well as a fascinatingly pertinent blog which I spent a satisfying amount of time browsing this morning, Great War Fiction.